Using the advanced technology of capacitive sensors instead of physical buttons, the comfort of your RV is literally at your fingertips with the CT Thermostat. Gentle taps on three input areas of the control give you access to all the climate control features. Touch any input and the display lights up so you can see your temperature, mode and set point.. 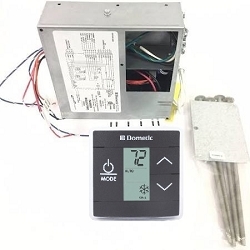 The CT Thermostat is very easy to use and can be set for manual or automatic operation of your non-ducted or ducted rooftop air conditioning unit. The large custom LCD display is easy to read and the blue backlight makes it easy to see even in low light. With just three capacitive-touch graphic symbols, the thermostat is simple to understand and operate..
With an updated look to complement your décor, the CT Thermostat has a gently curved bezel in a compact & low-profile design. Displays set temperature actual temperature displayed on demand. Efficient three-speed fan (high, low, auto) for interior comfort. Fahrenheit or Celsius temperature display. Digital temperature calibration maintains room temperature +/- 2. Auto fan will vary to maintain even room temperature. Memory retention in case of power loss unit returns to previous set points. Factory set default temperatures: Heating 68F/20C./Cooling 72F/22C. Furnace mode lets user select 1/ 2 on/off differential. Open back for pull through wiring. Back plate with two screws. System diagnostics displayed on demand. This thermostat is generally specific to the appliance it is being used with and is not universal. Please do not use with any other application other than that which is specified in the installation and operating instructions.